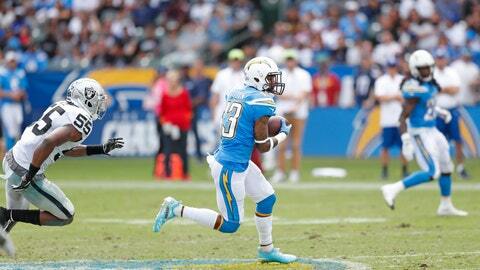 Keenan Allen and the Chargers score a big W over Oakland. CARSON, Calif. (AP) — Philip Rivers threw for 339 yards and two touchdowns, leading the Los Angeles Chargers to a 26-10 victory over the Oakland Raiders on Sunday. It is the 59th 300-yard passing game of Rivers’ 15-year career and his eighth against the Raiders. He completed 22 of 27 passes and had a passer rating of 143.4. The Chargers’ defense had three sacks and forced two turnovers which resulted in 13 points. Oakland’s Marshawn Lynch came into the game fourth in the league in rushing but was held to 31 yards on nine carries. He also had a costly interception in the end zone to Melvin Ingram during the third quarter. The Chargers turned that into a 96-yard, eight-play drive that was capped with Rivers’ 13-yard TD pass to Virgil Green early in the fourth period. The teams traded field goals before the Chargers took control, scoring 23 straight points. Austin Ekeler gave Los Angeles a 10-3 lead in the second quarter when he took a swing pass and went 44 yards for a score. Gordon’s touchdown put the Chargers up by two scores at halftime. Caleb Sturgis‘ 30-yard field goal extended the lead to 20-3 in the third quarter. The crowd at StubHub Center was predominantly Raiders fans, but it didn’t matter to the Chargers. The Chargers have won seven of their last eight at their temporary home until the new stadium at Inglewood opens in 2020. Ingram’s third-quarter interception was his first in 82 regular-season games. He did have an interception in the 2013 playoffs against Cincinnati. The Chargers signed punter Donnie Jones to be the new holder for Caleb Strugis, but Sturgis still missed an extra point. Sturgis’ PAT attempt after the Green touchdown bounced off the upright for his fourth miss of the season and third in the past two games. The sixth-year kicker has missed four extra points this season, equaling the amount he had over three seasons in Philadelphia from 2015-17.